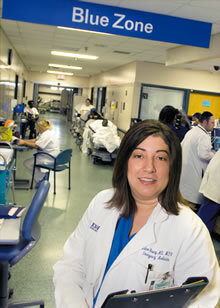 Debra E. Houry, MD, MPH. Debra E. Houry, MD, MPH, associate professor in the department of emergency medicine at Emory University School of Medicine, has been selected as a Fellow in the Hedwig van Ameringen Executive Leadership in Academic Medicine (ELAM) program. Houry, who is also vice chair for research of emergency medicine, is one of 54 fellows participating in the 19th incoming class for the ELAM program at Drexel University College of Medicine. ELAM is the only program in North America dedicated to preparing women for senior leadership roles in academic health institutions, where they enhance institutional leadership diversity while contributing to organizational strategy and innovation. "I'm very honored to be a participant in this program and excited to develop a project that will directly impact Emory," says Houry. "I look forward to working with an outstanding group of women from across the nation." In order to be accepted into the program, each Fellow must be nominated and supported by the dean or other senior official of her institution. ELAM continues to cultivate strong partnerships with participating institutions throughout the year-long fellowship. One aspect of this relationship is the curricular requirement to conduct an Institutional Action Project, developed in collaboration with the Fellows’ dean or other senior official. These action projects are designed to address an institutional or departmental need or priority. Upon completion of the one-year fellowship Houry and her classmates will join a community of highly accomplished leaders. More than 800 alumnae around the world currently serve in a variety of leadership positions in health care and accrediting organizations. ELAM is a core program of the Institute for Women’s Health and Leadership® at Drexel University College of Medicine in Philadelphia, Pa. The Institute continues the legacy of advancing women in medicine that began in 1850 with the founding of the Female Medical College of Pennsylvania, the nation’s first women’s medical school and a predecessor of today’s Drexel University College of Medicine. For more information on the ELAM program curriculum, faculty and participants, visit www.drexelmed.edu/elam.